I first read those words when I was young, much too young to comprehend their whimsicality. Wind in the Willows was a staple in my family, but the river life was not. Drawn more to mountains and dirt, we were not raised as “water people.” But there they were, these famous words, scrawled inside my old and distorted journal. I had hastily added them two years prior, before my first trip through the Grand Canyon, down the Colorado River. And now, as we slept on the banks of the river at the Lee’s Ferry put-in after a long day of rigging rafts, toying with oar rights, and making last-minute beer runs, I flipped through my entries from my first trip down the abyss. On the eve of such an anticipated return to the river—a few of us even had a “redemption rapid” or two that we were eager to conquer more smoothly on a second go-round—the water was calm, the sky was clear, and the cold front was settling in. Not long after dark, the November frost had already begun to gather on our strewn out sleeping bags, foreboding for a cold three weeks. But no one cared about the cold. Because, simply said, there is nothing better than messing around in boats. If one is to spend three weeks confined to a single landscape, it’s tough to find one that’s better than the Grand Canyon. Camp life is slow and loose when pressed so close against a water so quick and untiring. Juniper smolders in the stoked light of the fire as the eddy lines dance and the river boils swirl and bubble nearby. There is a stillness to this canyon that is unrivaled; it is not a cathedral but a monastery; not remote, but entirely removed; and nothing seems colored, only forcefully stained. And rarely does anything on the Colorado River ever dry. The skin on your hands will painfully crack, you will find sand in your hair for months after your trip, and you will be forced to test your restraint and discipline as you ration both your supply of dry socks and of beer. But they will be the most perfect days of your life. Obviously, gear is dependent on the season. The warmer, summer seasons, require a little less foresight. You will spend little time (if any) wrapped in a puffy down coat, and a pair of chacos and hiking shoes might be all you need. But in the winter, a dry suit is the most important piece of gear you can bring. Of the 21 days we spent on the river, perhaps only a small handful were spent on the boats without our drysuits worn. Even on the more relaxing days, it is best to start the day with the suit halfway on, tied around your waist, just in case you need to fully don the protection in a non-threatening yet substantially splashy rapid. 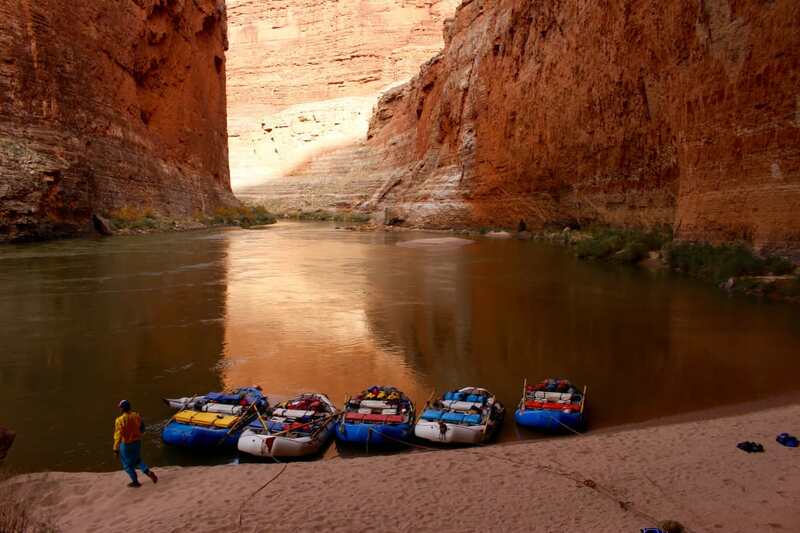 Realistically, the average Colorado River Grand Canyon permit recipient does not own the large and seemingly endless assortment of essential gear, or at least enough of said gear for an entire group. That is where outfitters, such as our go-to company Moenkopi Riverworks, prove invaluable. 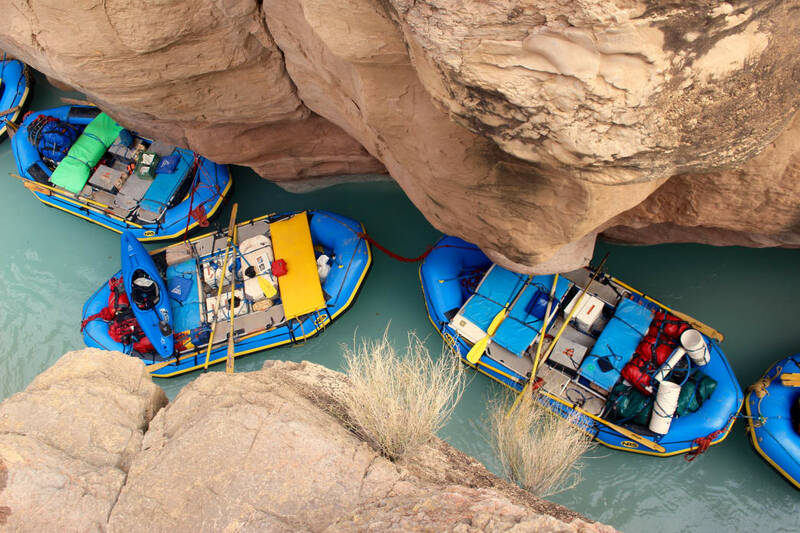 For reasonable prices, outfitters can supply a group with rentals of anything and everything: from rafts to entire kitchen set-ups, groovers (toilets) to coolers, dry bags, and any small piece of equipment a boat could need. For an extra price, most outfitters will go as far as planning and packing every meal, organized by day with easy-to-follow instructions and menus. While experienced trippers may opt to pack their own food, we can vouch that not having the stress of planning, purchasing, and packing group food for three weeks is well worth it. They say a good run in Lava Rapid, perhaps the most destructive and terribly fantastic rapid in the canyon stretch, only takes twenty seconds. Similarly, it is a rough estimate that rapids only make up 10% of your time on the river, if that. But they are without a doubt at the front of everyone’s mind every morning at coffee and every night at the fire. 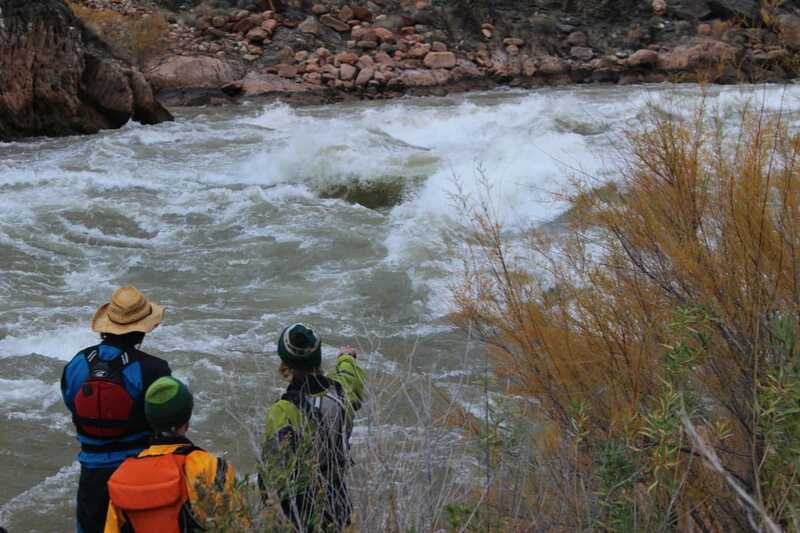 Other large rapids, such as Granite (mile 94), Hermit (mile 95.5), and Crystal (mile 99) are separated by short moments of both relief looking backwards and anxiety looking forward, if all goes well. Big-water days, however, are the magnetism of the river. There are unlimited reasons to journey down the Grand Canyon, but it is undeniable that the hydraulics in this stretch are unrivaled by any other river in the American West. You can plan, study, and scout as much as you want, but once you dip your oars into the current and pull out of the eddy, anything can happen. The Roaring Twenties whip you into shape in just the second day. Hance Rapid can have you pinballing down the endless stretch of waves. A failure to get far enough right in Bedrock will either pin you to rock mid-rapid, or send you through the washing machine on the left. Horn Creek Rapid can quickly turn into a ride on a rollercoaster-gone-wrong, and not straddling the gap properly between the wall and crashing holes in Upset will...well...it’s in the name. But the best stretch of big-water is the aforementioned Granite/Hermit/Crystal stretch: three of the five toughest rapids, all in a 5 mile stretch: you better wake up rowdy. Which is exactly how it went. Without scouting, simply relying on a brash cocktail of memory, a last-ditch guide book examination, and frantic shouting from boat to boat over the roar of the rapid, we hit the Granite/Hermit/Crystal stretch with full force. Bunched tightly in single-file order, each oarsman would periodically pop quickly to their feet and strain their neck: ground hogs on rubber boats peering down a smooth tongue into the chaos. Without warning, each raft would surge ahead of the group as it suddenly caught the top of the rapid and accelerate into the mess, either rowing furiously to follow the line or squaring up to the crashing waves. The boaters behind, in their natural state, would pop up to their feet again, watch their buddy navigate the rapid, make mental notes, and then find themselves swept into the wave train. No other day, and no other rapids—save for Lava—have such power to remind us that, while this river may be restrained upstream by the famous Glen Canyon Dam, it is still a surging, pounding, untameable beast. 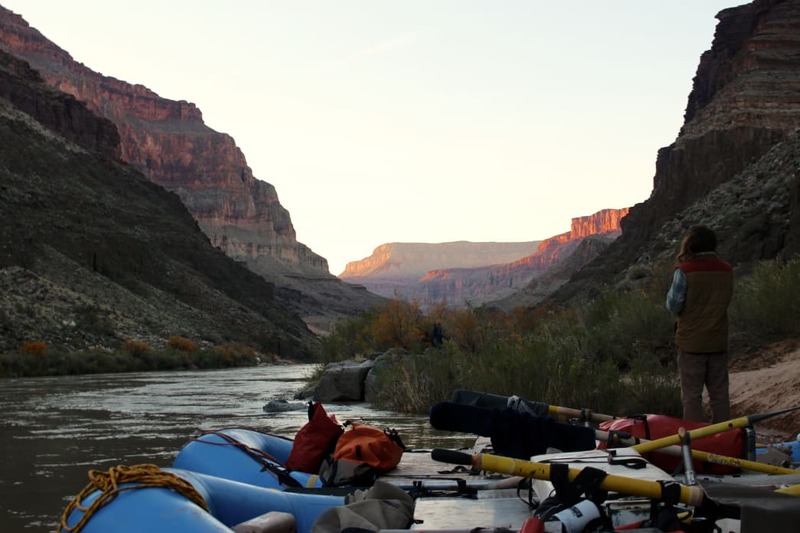 And so while much is made—and rightly so—of the messing around in boats, it is the days off of the boats and removed from the river that make a Grand Canyon river trip remarkable. Just as you would not venture down the river without a guidebook to the rapids, it is equally worth it to invest in a thick guide book to all of the hiking and slot canyon rappelling to be found on dry land along the way. Three (or even four) weeks is an awfully long time to enjoy the Grand Canyon, and there is plenty of exploration to be found, shore-side naps to be snoozed, and books to be enjoyed while the world outside the canyon hurls on at a much faster clip, unnoticed and unminded to the boaters at the bottom. For climbers, there is an astounding amount of slot-canyons to explore and rappel. A favorite is the canyon at mile 44, President Harding Camp. The wash, while looking unmanageable from below, includes 7 rappels totalling over 650 feet of combined drop on the rope. 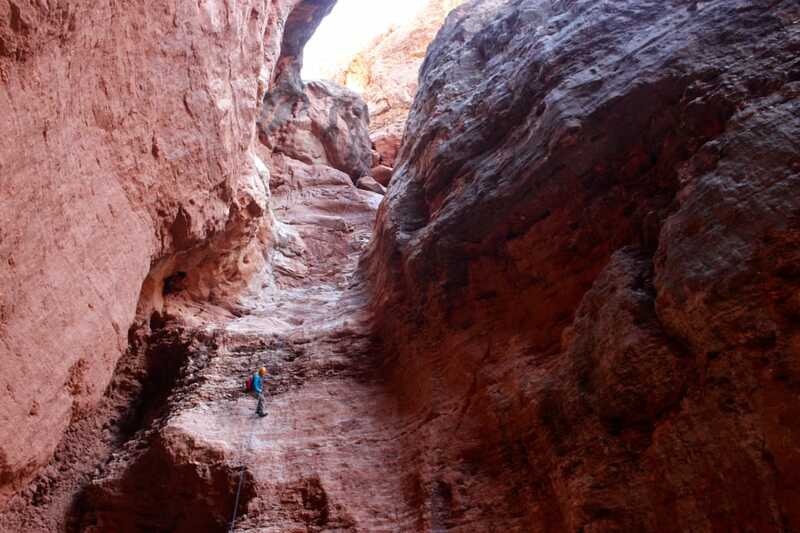 Never explore a slot canyon without consulting the guidebook first, and never commit to dropping down even short rappels without the right gear and time to assume you won’t be able to retrace your steps backwards. One of the many extraordinary hikes is found while camping at either Racetrack Camp (around mile 134) or directly beneath the ensuing rapid. Start early and plan on a long trek with lots of uphill: once you start venturing up Tapeats Creek, you won’t want to turn back. Eventually you can veer left and follow Thunder River, up to Thunder River Springs, where the waterfall flows directly from a spring hidden deep inside the towering canyon walls. Turn around, or complete the loop through Surprise Valley and enjoy the famous “Patio” above Deer Creek. It is this writer’s belief to push for early mornings and longer efforts on the river. The more mileage you row on flat water days, the more layover days you are allowed at camp. More layover days means a more complete immersion into the river, the canyon, and the treasured life that defines this slow escape down the rabbit hole. With the ever-looming threat of development in the Grand Canyon and along the Colorado River, one of the most unspoiled stretches of the American West grows more and more treasured with age. Such wilderness is hard to find nowadays, and the raw immersion into a completely self-sufficient wilderness should be preserved (visit American Rivers to learn more). Because the experience is not just in the simple sight seeing of the canyon and river, it is in the actual doing of the thing: the actual rowing of the oars a couple hundred miles, the waking up at 6:30 for coffee and the falling asleep under the stars when it is dark at 8, the transformation of putting yourself out there where few others have been, where there are no crowds, where places are hard to get to. Because messing around in boats in these places is worth doing. Written by Brian Bates for RootsRated.